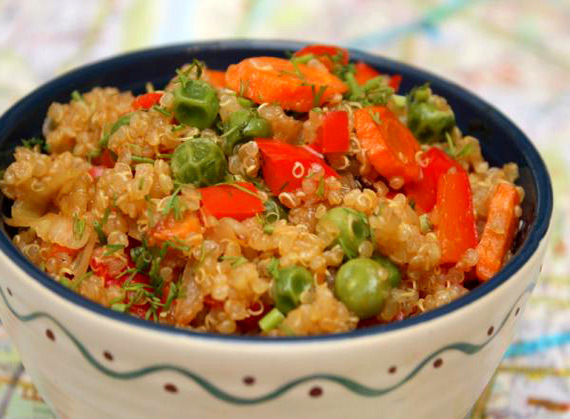 Quinoa is considered the most nutritious and one of the healthiest grain in the world. It is high in protein and is gluten-free. Prepare this easy and healthy dish. It is good for gluten-free diet. In large pan cook onions, grated ginger and garlic in sesame seed/coconut oil until soft. Add in frozen veggies and cook for a minute to thaw them out. Then add cooked quinoa and Bragg’s Liquid Aminos or soy sauce. Stir well and then push the mixture to the sides of the pan and pour the beaten eggs in the middle. Once the eggs have scrambled, mix them in with the rest of the quinoa mixture. Add more Braggs and sesame oil to taste.